The team management said that the stakes for the 2011 OFC championship are high and Solomon Islands must not be complacent and having the squad in place early is an important step in the preparations. 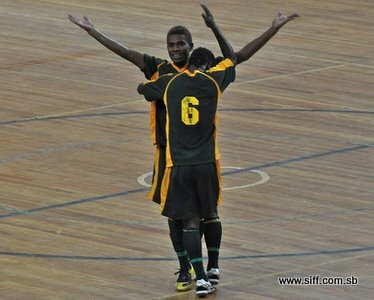 What is at stake is no less than a ticket to the FIFA Futsal World Cup in Thailand in 2012 and possible outings in international competitions along the way so the pressure is on Kurukuru to make sure they are victorious again in the 2011 championship. Head coach, Dickson Kadau, says that all the other teams in the region have Solomon Islands as the team to beat in 2011 and this puts the Kurukuru team in a situation where it has to perform even better than they did in this year. Kadau’s 2011 list has all the big names included with Elliot Ragomo, Jack Wetney and Micah Lea’alafa all making the cut and are expected to play the biggest roles in the team. Forward Moffat Sikwa’ae and goalkeeper Alick Lioka Jnr. make a surprise return to the line up after both were dropped for the regional championship in August and the latter has expressed great joy at returning to the national team. “It is a great feeling to be back in the national team, this is a great team with great players and I enjoy being part of it,” Lioka Jnr. says. Lioka’s return to the squad comes at the expense of Paul Huia who has been struggling with a knee injury and needs time to recover over the next few months. Also missing in the team list is pivot, Jenan Kapu, who is also nursing a knee injury. It will be the first time for Kapu to be excluded from Kurukuru since he made the draft into the senior team in 2008. With the team in place the team management can focus on each player for their preparations for the 2011 season and assistant coach Jerry Sam says that months of hard work lay ahead. “We need to work really hard to win next year and that is exactly what we will do. Hard work has been our greatest asset in past championships and so far the commitment of the players to their training routine has been great,” Sam says.